BLACK CUMIN OIL – FROM INDIA extracted from organic black cumin seeds. The most well known saying is often quoted as, “Black Cumin is the remedy for all diseases except death.” This is because it has been found to cure or alleviate hundreds of illnesses and allergies, both by external skin applications, and internally, by pouring it over your food. These black seeds contain over 100 known chemical compounds. 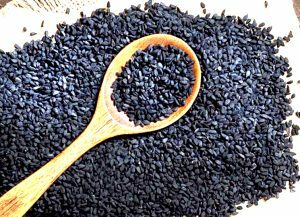 The main active ingredient in black cumin seed oil is crystalline nigellone. This seed oil also contains beta sitosterol, myristic acid, palmitic acid, and a wide variety of essential fatty acids and phytosterols. These increase the elasticity of blood vessel walls, while lowering cholesterol. It contains a variety of Vitamins: A, B1, B2, B6, C, Niacin and Folic acid. It also contains a wide range of minerals: calcium, potassium, zinc, magnesium, selenium, copper, phosphorus and iron. The high content of phytosterols found in Black Cumin Oil boost the human body’s production of hormones, and provitamin D. These aid in the prevention of endocrine disorders, immune deficiency and heart disease. Organic Black Cumin Seed Oil is known to be effective at combating auto-immune skin disorders, making it the choice for psoriasis and eczema treatment. Black cumin does this by helping to stimulate the production of bone marrow, and cells of the immune system. It increases the production of the body’s own interferon, which is a major defender against bacteria, viruses, and other micro-invaders. Therefore, it protects cells from the damaging effects of harmful invaders, and increases the number of antibody-producing B cells. Organic Black Cumin Seed Oil may also help relieve pain caused by arthritis, or tense muscles, so it is a perfect choice for massage oil blends, and should be used unheated over food, daily for arthritis sufferers. You can add Organic Black Cumin Oil to your hair conditioner and body moisturizer, for true nutrition for your hair and skin. Massaged into the roots of your hair, it has been reported to stop hair loss. There are over 600 scientific studies on Black Cumin, ranging from acne to auto-immune disorders, so scientists are taking this superfood oil very seriously. This delicious, brown oil with a mushroom-nutty taste enhances any pasta dish, or potato recipe, or simply use it in place of your usual oil or butter.